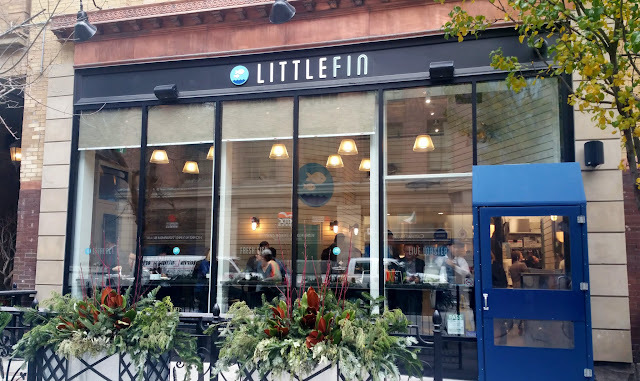 I made my way to the financial district a couple of weeks ago for lunch at Little Fin (Twitter: @Little_Fin, Facebook: Little Fin) located at the Dineen building. First thing I noticed was suits everywhereee! Did you know I used to be one of them? Well, not literally in a suit but I was in finance ever since I graduated from uni until two years ago. I remember the rat race from Union Station every morning, and getting lost in The Path, and climbing that never-ending corporate ladder like it was yesterday. Ah, memories. Anyway, back to Little Fin! 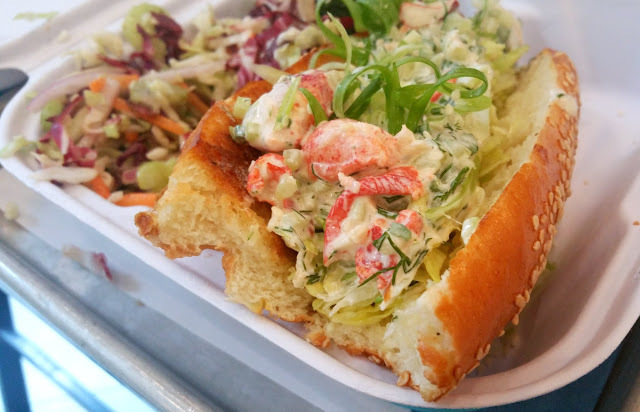 This small seafood shop from The Chase Hospitality Group (the same people behind The Chase, The Chase Fish & Oyster, Colette and Kasa Moto) focuses on gourmet salads, fish sandwiches, and lobster offerings such as lobster poutine, lobster grilled cheese and lobster rolls. Little Fin is very small but there's still seating available...not many but it's there (more seating in the summer with the patio). It gets really crowded during lunch so a lot of people also do take-out there. If you're in a hurry you can always grab one of these salads and eat at your desk ;) That day Little Fin had a cumin, carrot and chickpea salad for $3.50, and a radicchio and panzanella salad for $4. Little Fin is also partnered with UberEATS, the newest door to door delivery service launched three days ago in Toronto. I really liked this salad. The crisp greens were well-dressed with a light and creamy avocado dressing. There was also a hard-boiled egg...plenty of shrimps too! The Chorizo Sandwich was the feature sandwich that day. I wasn't a fan. I didn't think the goat's cheese salsa went well with the chorizo, and just a lot of things going in general with the kale and pickled chili too. I think less ingredients with a more focused flavour profile would've been better. It was also very hard to eat because everything inside the bun would fall out once you take a bite. I also prefer a softer bun. As for the sides, they were really delicious, especially those garlic wedge potatos! They were amazing with that tangy, spicy and sweet "Fancy Sauce", Little Fin's secret sauce. Featured soup of the day. It was hot, creamy and hearty. Quite good. 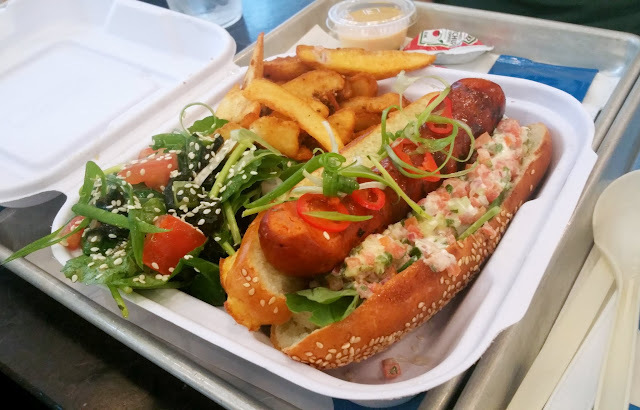 The Lobster Roll was good. It had a modest amount of lobster but I wish they had bigger pieces of meat instead of chopping them down so small. 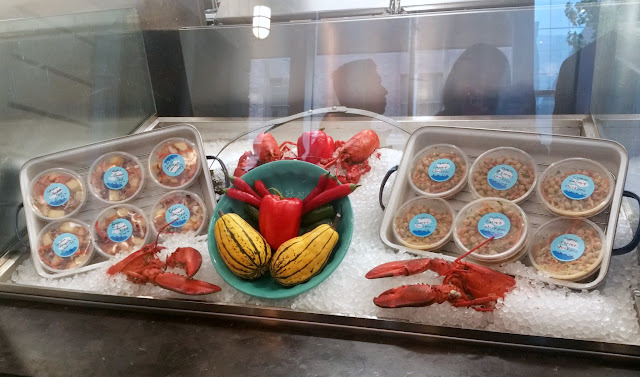 The lobster and everything else was also too dressed for my taste. I enjoyed the warm chili spiced broccoli. All in all, I like Little Fin. 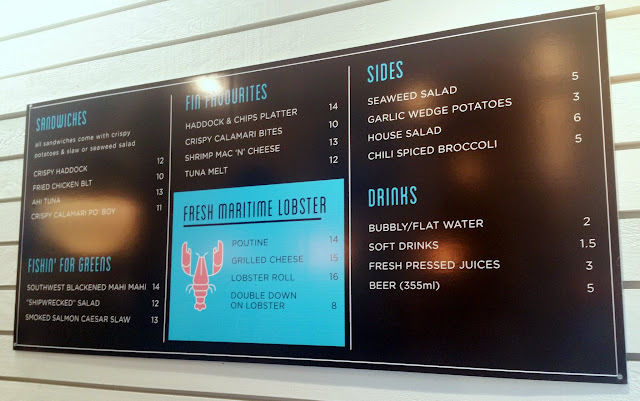 Their seafood salads, fish sandwiches and "Fin Favourites" like their shrimp mac 'n' cheese, tuna melt and crispy calamari bites are all things that I would love to try since they are not easy to come by in the financial district, especially for lunch. 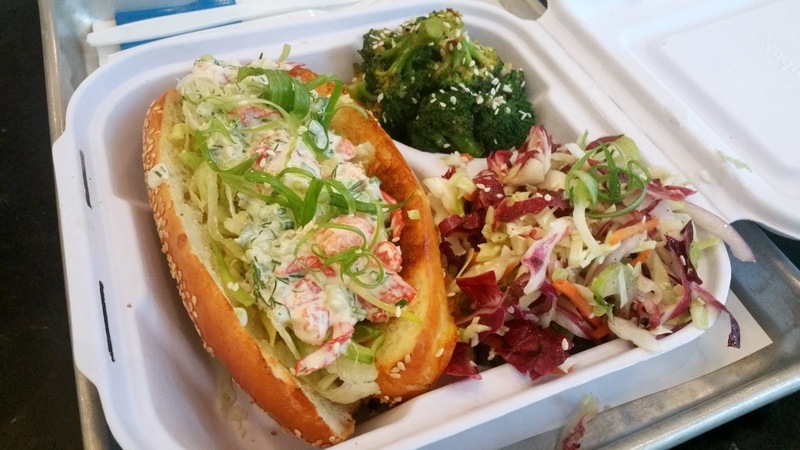 The seafood spot is a great option for people working in the area. Having said that, I'm not sure that Little Fin will be a frequent lunch spot for me only because I find it a bit pricey. I tend to splurge on dinners often so I naturally have to watch my spending on lunches. Something's gotta give, right?